Family: Canidae Canis lupus familiarisPhoto Wiki Commons, couresty Helene Gisin. The Norwich Terrier is very rambunctious and self-assured, but it is also a devoted companion! The Norwich is one of the smallest Terrier breeds. Like many types of terriers it was bred to hunt rodents. It was used to hunt rats in the stables, and also to bolt foxes during hunts. When the practice of cropping drop ears of show dogs became illegal England, there was much debate about the recognized standard of this dog. The breed was split into two recognized breeds, the Norwich Terrier with prick ears and the Norfolk Terrier with drop ears. Norwich Terriers have the trademark Terrier personality. They are courageous, active and willful. They are also very loving dogs that need plenty of companionship. The Norwich is very alert and intelligent, and needs something to occupy its mind at all times. A very sociable dog, it loves to play and gets along well with children and is usually okay with strangers. It does fine with most other pets, but should not be trusted with rodents. Overall the The Norwich Terrier is a healthy breed but when choosing one for a pet, it is important to be aware of potential health problems of the breed. These include epilepsy, joint problems, heart disease, and Upper Airway Syndrome. Breed Type The Norwich is one of the smallest Terrier breeds. Bred to hunt rodents, the Norwich Terrier is also a devoted companion. Background The Norwich Terrier came into existence in England in the 1800s. They were used to hunt rats in the stables, and also to bolt foxes during hunts. This breed is believed to be a descendent of either the Irish Terrier or the extinct Trumpington Terrier. In the early days of kennel club recognition, the Norwich Terrier could have prick or drop ears. Drop ears of show dogs were cropped until it became an illegal practice in England. After much debate, the breed was split. Those with prick ears were still recognized as Norwich Terriers, and those with drop ears were known as Norfolk Terriers. Description The Norwich Terrier has a short but sturdy build. Its eyes are dark, and its ears stand erect. The face sports distinctive whiskers and eyebrows. The tail is usually docked to half its original length where permitted. The straight, wiry coat comes in red, wheaten, tan, black and tan, and grizzle (red and black hairs throughout the coat). Norwich Terriers are about 10 inches tall, and usually weigh between 10 and 12 pounds. Care and Feeding The best food sources for the Norwich Terrier include fish, pork, beef, potato, wheat and oats. Minerals should come from sea kelp and oyster shell. This breed needs a daily combing and brushing of its coat. Baths or dry shampoos should be given only when necessary. The coat should be hand-stripped at least twice a year, preferably more often. Clipping can damage the coat, and should only be done on elderly dogs that cannot tolerate stripping. This breed's tail is usually docked at 2 or 3 days of age. Norwich Terriers shed lightly. Regular vacuuming is sufficient to keep hair off of furniture and carpets. Housing Your Dog Norwich Terriers can do well in small spaces, and do not need much of a yard as long as they get lots of exercise. It needs plenty of toys to occupy its mind. Social Behaviors The Norwich Terrier is a very sociable dog. It loves to play and gets along well with children. It usually does fine around strangers. It is good with other dogs and most other types of pets, but should not be trusted around rodents.s. Handling and Training The Norwich Terrier is reasonably easy to train, but is prone to stubborn spells. Patience and consistency are important. This breed is happiest when it has plenty of mental stimulation and physical activity, so it is a good idea to enroll it in obedience or agility classes. Activities Norwich Terriers have lots of energy, and therefore need plenty of exercise. Much of this can be accomplished through work and play, but a daily walk is also important. 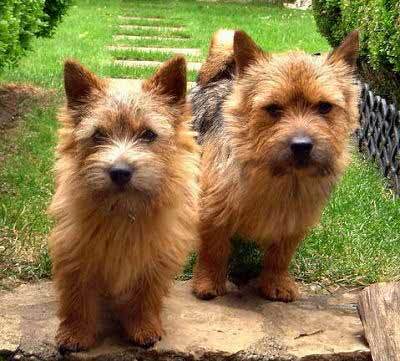 Breeding/Reproduction Norwich Terriers usually have small litters, and they often have difficulty whelping. Caesarean sections are often necessary. When breeding your Norwich, bloodlines of both dogs should be checked for epilepsy, hip dysplasia and heart disease. Common Health Problems In general, the Norwich Terrier is a healthy breed but it is important to be aware of potential health problems. These include epilepsy, joint problems, heart disease, and Upper Airway Syndrome. It is also prone to tick infestation, so it is crucial to take preventive measures. Availability Norwich Terriers are in short supply. Breeders may be located online if there are none in your immediate area, but it is very important to seek out reputable ones. Some unscrupulous breeders have been known to pass off mixed breeds or Cairn Terriers with docked tails as Norwich Terriers. Prices vary greatly, and are often in excess of $2,000.